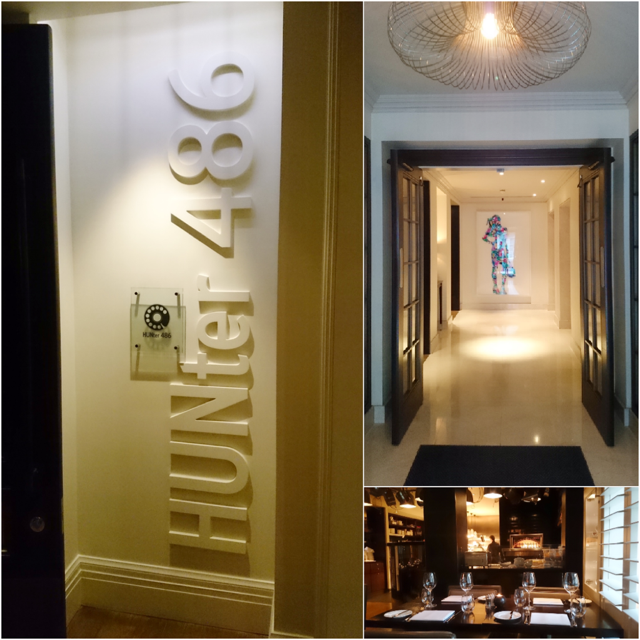 A few weeks ago me and hubby ventured into London on a foodie day which ended with a lovely meal at *Hunter 486 inside The Arch London hotel. This boutique hotel is spread across a number of beautiful mews houses and Victorian townhouses...the type of house most of us can only dream of owning in London. The hotel is just round the corner from Oxford street and a few minutes walk from hyde park which makes it the perfect location. 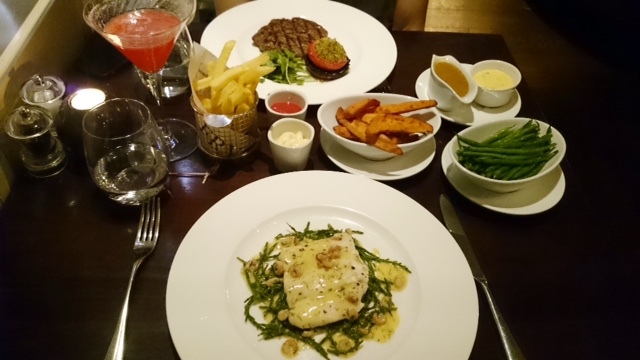 We did book for an early meal starting at 6pm but got slightly carried away with shopping so we changed our booking to 7pm and arrived shortly after and got seated quickly. 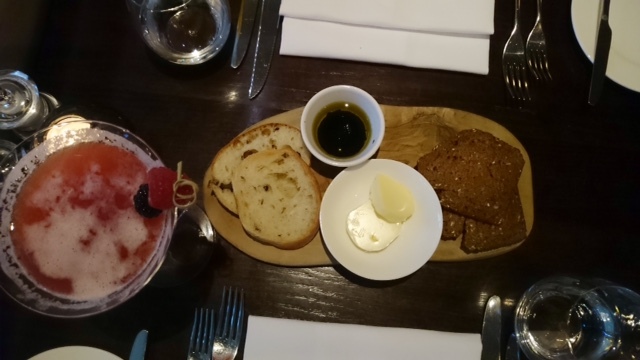 Whilst sipping my chuck berry mocktail we looked through the menu to decide what to order, the menu is short and sweet with something to suit all tastes. After a day of shopping we were both so hungry and wanted to order everything. 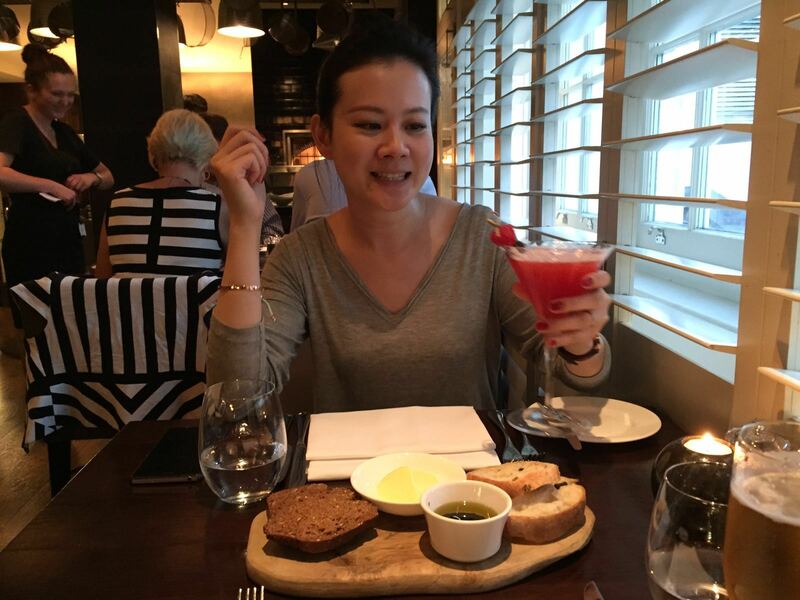 Yes I am looking way too excited holding that mocktail! Homemade bread to begin with and for starters I went for the dressed Dorset crab with avocado and pink grapefruit. So refreshing and the crab was so sweet and fresh. With me being a huge seafood lover I am rather greedy and would have liked more crab! 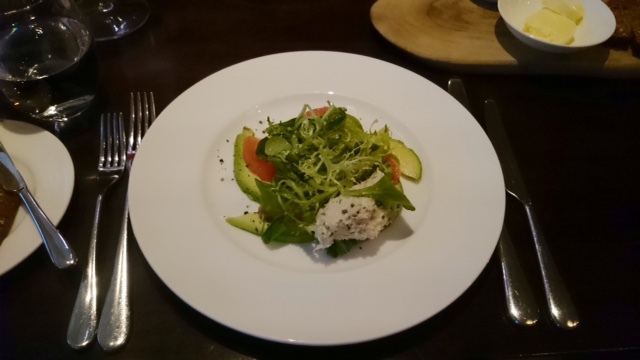 It was so surprising how the grapefruit goes very well with the crab, avocado and salad. 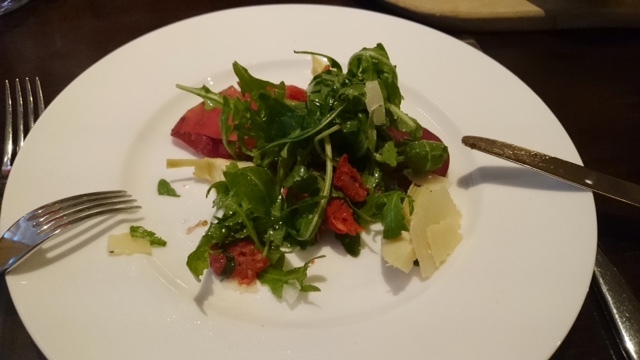 Hubby went for the cured beef with artichokes, rocket, sun blushed tomatoes and parmesan. This was a simple tasty refreshing light starter for a warm day. Service was very good with the waiting times in between each course being just right for us. 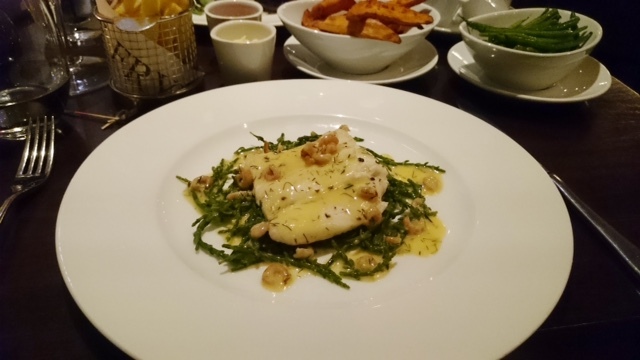 For mains I opted for the the steamed leamon sole fillet with samphire and brown shrimp butter. I always love eating fish in restaurants tasting the various ways of cooking. Usually at home we tend to cook the asian way of steaming a whole fish with ginger / spring onion or shallow frying it. Hubby went for the rose county rib eye with all the sources and chips. He told me his rib eye was simply cook to perfection medium rare exactly how he liked it and the meat was tender. I picked 2 extra sides to share sweet potato chips were an obvious choice and some simple butter green beans. 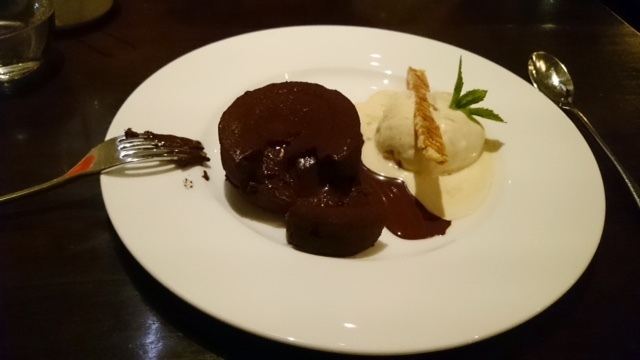 I am a real sucker for warm puddings and this one was exactly that chocolate fondant with vanilla ice cream and honeycomb. Shared this with hubby and regret sharing with him we should have ordered one each! 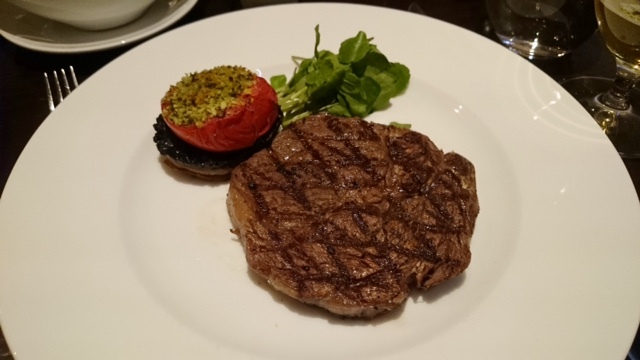 We really enjoyed our meal here definitely a place to come back to stay over for the night as a treat since the location is so convenient and the food menu is very reasonably priced. Our belly's were nice and full if only we can walk upstairs to one of the rooms to crash out...sadly we had to head back to get the tube to pick up our car and begin our 1.5 hour journey home. Wonderful evening and I would love to come back to try the Sunday Roast next time...thanks for having us!